The Kandinsky Collective uses speculative fiction as a strategy to shed light on the discourse that surrounds my analog steganography research; privacy, surveillance and the instrumentalisation of art and graphic design in media activism. Departing from the rumour that during WWII the artist Wassily Kandinksy was recruited by the British Intelligence to smuggle secret communication by encoding it into his abstract, systematic and symbolic artworks, The Kandinsky Collective exhibition explores the subversive potential of using the formal language of contemporary 'high' art as a means to embed hidden messages. Set in the near future when privacy has become a crime, the exhibition is in fact a staged exhibition of privacy activists posing as a contemporary art collective, where they co-opt abstract art as a cover to form an underground communication channel. 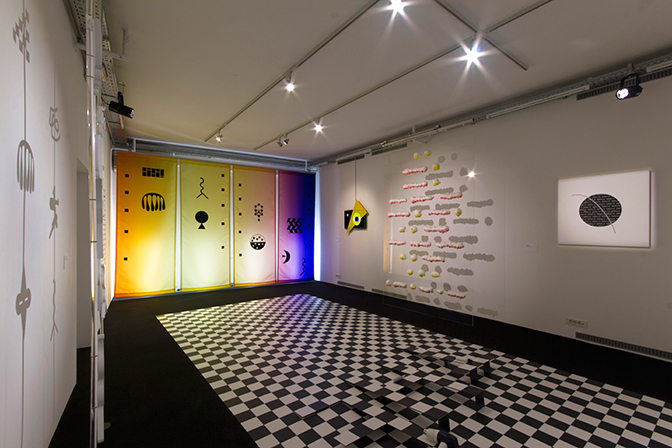 During the opening night, the audience was invited to participate in the decoding, activation and discovery of the second narrative hidden within the visual facade, which functioned as a highly aesthetic decorative trap or distraction strategy. Using steganographic techniques such as the Cardan grille (the superimposition of grids on texts to uncover hidden text), substitution ciphers, camouflaged objects and camouflaged text within text, in combination with invisible inks, the audience uncovered one word in each of the six 'artworks' that when read together spells out a full sentence. Along side the exhibition, an artist talk was given at Academy of Fine Arts and Design of the University of Ljubljana. Furthermore, as a part of the Aksioma brochure series, Florian Cramer wrote an introductory essay on steganography in relation to my work titled Hiding in Plain Sight. Here are a few Slovenian press reviews written by Jela Krečič for Delo, Maja Šučur for Dnevnik.si, Mojca Kumerdej for Delo Saturday Supplement (for English translation visit here) and appearance on Slovenia national news, RTV4. Photos by Janez Janša and Jure Goršič.